Ross Lipman of the UCLA Film and Television Archive has become one of the foremost and experienced experts in the realm of Independent Cinema. He’s restored and preserved some landmark works of independent cinema including The Times of Harvey Milk, some of Kenneth Anger‘s most prominent titles, and the incredible Killer of Sheep. I would argue that he is doing some of the most important and thankless work in the film world, and as someone who has had the pleasure of seeing several of his major restorations projected in a cinema, I can attest to the remarkable difference he has made with the titles he has worked on – not only restoring them from all possible states of degradation, but preserving them for future generations. I think that anyone that saw Killer of Sheep via one of the barely available 16mm prints before the restored version would certainly agree. Ross was kind enough to answer a few questions about his work on The Exiles (Opening at the Walker on January 16) via email. As I understand it, The Exiles was essentially considered lost until Thom Anderson used a clip in his documentary Los Angeles Plays Itself. From there, how did the film and the restoration project get to you at UCLA? The Exiles wasn’t so much lost as forgotten. 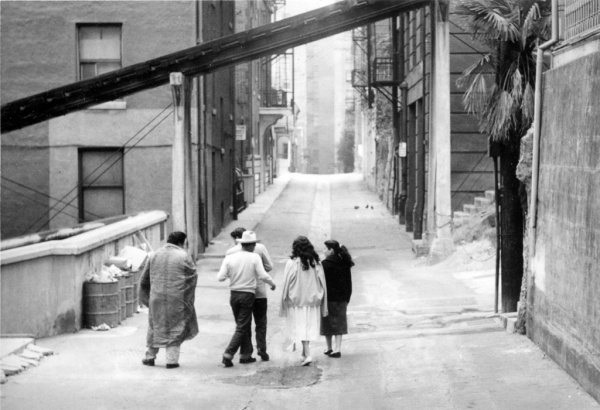 Los Angeles Plays Itself essentially brought the film to the light of day. Then Dennis Doros and Amy Heller at Milestone bought the rights and hunted the original down to where it was archived at USC. I was thrilled when he offered us the restoration job. When you began the project, what film elements did you have access to, and what state were they in? We had Kent Mackenzie’s original picture and soundtrack negatives, which were in pristine physical condition. That’s the ideal starting place. Can you describe the restoration process on this particular film and its timeline? We had the advantage of not just the original negative, but also a decent reference print and access to two of the cinematographers, John Morrill and Erik Daarstad. Under those circumstances, it’s mainly a question of grading and printing technique. That’s the process whereby one works out the film’s contrast and light values on a shot-by-shot basis. The tricky part came in when we needed to strike the duplicate negative, because there’s generational loss in analog film printing. Much of The Exiles was shot under high contrast, low light conditions, meaning it would be very easy to lose shadow detail. We went throughan extended testing process before we got what we were looking for in the release prints. I’m indebted to Walt Rose of Fotokem for his painstaking work on this. The restoration of The Exiles was preceded by your restoration of Charles Burnett’s Killer of Sheep. Did the process of restoring Killer of Sheep inform your work on The Exiles at all? Each restoration is a different story, but obviously you’re able to pick up certain techniques as you go along. Killer of Sheep was much more difficult than The Exiles from a technical standpoint, as the originals were in much worse shape. But The Exiles presented its own challenges. Charles Burnett (The Director of Killer of Sheep), along with Sherman Alexie, is credited as a presenter of the restored film. What role did he play in this project? Charles and Sherman lend their name to the release and help call critical attention to it. It’s a form of advertising for a good cause, in that they attract viewers who otherwise might not be interested in an “old, post-dubbed indy about Native Americans”. In the case of Charles it also spoke to his youth, as he knew downtown Los Angeles like the back of his hand and had ridden the Angels Flight. He also saw in Kent Mackenzie a kindred spirit in obscurity–an obsessed director working in a humanist neo-realist tradition in the maze of Los Angeles. I was particularly thrilled to work on The Exiles as it allowed me to continue developing my work in restoring American independent cinema. It’s so easy to get deceived by Hollywood as the dominant image of American narrative film. Our documentary and experimental work is largely respected abroad, but voices like Burnett, Mackenzie, Shirley Clarke, John Cassavetes, and many others comprise a strikingly powerful communal voice in the narrative realm. Look for some surprises in the coming years if UCLA can get the funding. Next up is Barbara Loden’s Wanda.